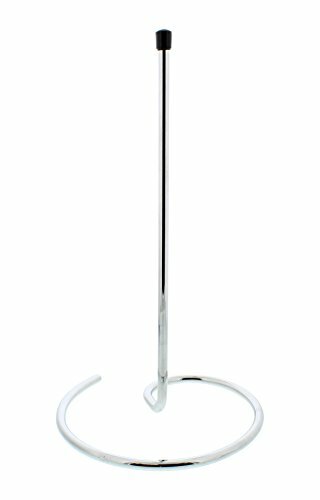 Decanter Drying Stem Rack Stand - 13” Tall, Sturdy & Elegant by G Francis at Verve Wine Bar. MPN: 7562. Hurry! Limited time offer. Offer valid only while supplies last. Water spots, fingerprints, streaks, and scratches make your glassware and crystal look tacky. Keep it classy and hang dry your decanters on the G.
Water spots, fingerprints, streaks, and scratches make your glassware and crystal look tacky. Keep it classy and hang dry your decanters on the G. Francis Wine Decanter Drying Stem. Watch the face of the wine enthusiasts in your life light up when they open this subtle, yet useful stem as a gift. The graceful design of the stem matches the refined decanter shape. It is designed with a spiraled, 6 ¾-inch base so it will not tip over and has a 12-inch stem to accommodate most decanter sizes. The stem itself is dishwasher safe and requires low maintenance care. Protect the crystal-clear, elegant appearance of wine decanters with the G. Francis Decanter Drying Stem. If you have any questions about this product by G Francis, contact us by completing and submitting the form below. If you are looking for a specif part number, please include it with your message.